Have you ever carefully applied your foundation, only to end up with a patchy, streaky or sheer finish? Maybe it's settling into fine lines, clinging to dry patches or settling into the pores. Whilst that old adage a poor workman blames his tools might spring to mind, isn't always a case of user error. Using the right tools can make all the difference to the finish of your products — even taking the same product from a sheer to full coverage finish, depending on the application method. 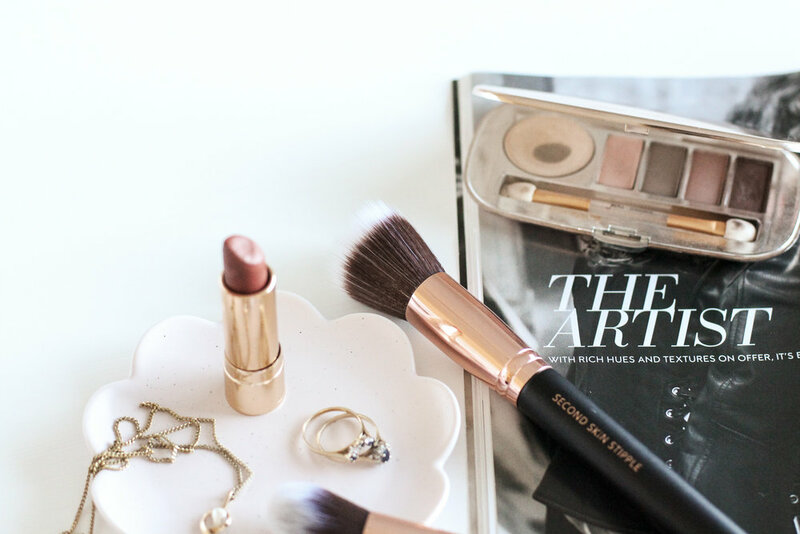 Everyone has their preferred method for applying makeup, whether it be fingers, brushes, sponges or a combination. There is no right or wrong way, as long as you're achieving the desired result. Choosing the right brushes for the right products can be a little overwhelming, so I've created a handy guide to helping you choose the right type of brush based on the product, and desired finish for you below. In this guide I’ve covered the basics for the face — if you’d like to see a guide for eyeshadow brushes let me know in the comments below! Densely packed, short bristles, with a completely flat top (not domed). Not to be confused with Stippling Brushes, which can be similar in appearance, but are less dense and have longer bristles. Mineral powder foundations. Apply in sweeping or circular motions, making sure to tap excess product from the brush before application. Cream foundations, concealers and blushes. Apply in dabbing motion or 'streaks', applying from the centre of the face outwards and towards the jawline. Very similar in appearance to Flat-topped foundation brushes, a Stippling Brush is has a completely flat top (not domed), with medium-long length bristles and are softly packed. Liquid foundations. Apply in a soft circular or stippling (dabbing) motion. Provides sheer to light coverage, can be medium dependant on the product, but this is definitely on the light side. Big, fluffy brush with a domed top, medium to long bristle length. Loose or pressed setting or finishing powders or even pressed foundations. Can also be used for loose or pressed bronzers and blush. Apply in a soft, sweeping motion, or 'press and roll'. Very similar to a flat or paddle brush - just much smaller! A small paddle-shaped brush, with firm (but soft enough to get into all those contours), densely packed bristles of a medium length and rounded edge. Usually about the size of your fingernail. Cream or liquid concealers or colour correctors. Used for spot-concealing, dark circles and lining around the lips for a crisp finish. Use a dabbing motion. This can look very similar to a cream concealer brush or eyeshadow brush, but is usually thicker (not as flat as the above), still with firm, densely packed bristles and a rounded top. Mineral or powder concealers. Used for spot-concealing, dark circles, and blemishes. Use a dabbing motion. Medium or large fluffy brush with a domed top or angled edge, medium bristle length. Pressed or loose powder blushes, bronzers or setting powders. I hope you’ve found this helpful, and let me know if you need any help choosing the right brushes or have any questions by leaving a comment!